What can hypnosis do for the OCD sufferer? All natural and drug-free solution to Obsessive Compulsive Disorder (OCD)? A great deal. One thing that is certain is that the more hypnosis is recognized by the medical establishment as a truly legitimate healing modality, the more OCD sufferers will benefit. This is obvious because most of the recent, significant breakthroughs in OCD treatment have been centered around Cognitive-Behavioral Therapy. C.B.T. is a form of talk therapy that can be blended very nicely with hypnosis. I have created the Relieve OCD Hypnosis MP3 to help you relieve the symptoms of obsessive compulsive disorder. Also! since OCD is recognized as an anxiety disorder, it stands to reason that the medically proven effects of hypnosis on anxiety can be applied with a good chance of success to OCD. This success can be observed in degree rather than in a “pass/fail” measurement. Through my personal and professional experience I am certain that hypnosis and neuro-linguistic programming (NLP) will play an even greater role in the treatment of Obsessive-Compulsive Disorder. I state this because it is only a question of time before more evidence comes to light concerning the emotional etiology of OCD. My observations and convictions do not agree with the established opinion of most “experts” who believe that the psychological experience of insight has nothing to do with the treatment of OCD. Many OCD experts believe that sexual abuse, bad parenting, childhood neglect, abuse, early loss and other related trauma have nothing to do with OCD. As it would be too lengthy to go into mine or my clients’ personal experiences and resolutions, suffice it to say that these experts are evincing a very narrow perspective. To anyone reading this who subscribes to the Emotional-Newtonian, Flat Earth Society, Pharmaceutical Mouth Piece, point of view that OCD is purely bio-chemical in nature and not at all psychogenic in origin I pose this question: Why do widely published experts (Dr. Jeffrey M. Schwartz, M.D. for example) believe that OCD can be conquered with just talk? This widely noted expert states that an OCD sufferer can actually change their brain chemistry through a cognitive-behavioral process. And without professional assistance! Doesn’t this point of view beg the question that if an OCD sufferer has abnormal brain chemistry that can be altered with healthy talk therapy, then perhaps the condition was a result of abnormal cognitive-behavioral processes such as sexual abuse, bad parenting, neglect and so on? Another very interesting fact to note is that it is well known that stress can either exacerbate or trigger the onset of OCD symptoms. This seems to point at the fact that it is a distorted cognitive process preceding the appearance of abnormal brain chemistry. In conclusion, I would like to state that the contributions of hypnosis and NLP (combined with appropriate drug therapy when necessary) to the successful treatment of OCD will be very welcomed by those who suffer. Address Obsessive Compulsive Disorder successfully with Hypnotherapy!!! Hypnosis is one of the most effective, drug free ways to overcome OCD. Recent investigations into the treatment of Obsessive Compulsive Disorder (OCD) have found that behavioral modification therapy can provide some relief and put sufferers back on track for a much less anxious lifestyle. Behavior modification and the thought processes that lead up to it are what hypnosis is all about. Part of the thought process of someone with OCD is a belief that the ritual they perform is able to solve the problem. For example, if there is a fear that objects around them are contaminated with germs the obsessive-compulsive behavior becomes excessive hand washing. Hypnosis is able to turn fears such as this into rational thoughts about what is truly contaminated and what isn’t. Hypnosis is also able to modify behaviors resulting from fears. Hypnosis differs on one very positive way from behavior modification therapies. Instead of having the OCD sufferer have to put himself into a fearful situation and then not allowing himself the compulsive behavior, hypnosis does this subconsciously. So for example, instead of having the patient touch the door knob and then force himself not to wash his hands immediately, hypnosis creates a response for this in the subconscious mind. Hypnosis is a much gentler approach to behavior modification. 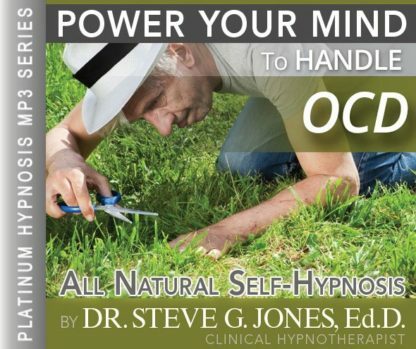 Steve G. Jones is a clinical hypnotherapist who has created the Relieve OCD Hypnosis MP3 session. This program teaches relaxation and also changes perceptions about fears and how to deal with them. This is an effective way to relieve OCD and put the mind of the OCD sufferer at ease. Don’t suffer any longer !!! Power Your Mind to Address OCD (Obsessive Compulsive Disorder) today with effective Hypnotherapy by Steve G. Jones! But you can get all the benefits for this low price. Simply listen to the Relieve OCD Hypnosis MP3 download every night as you go to bed for three weeks and feel the changes happening in your life. You will feel more empowered, more in touch with your true self, and you will truly know that your goals are within your reach. Obsessive Compulsive Disorder, or OCD for short, is a disorder in which people are controlled by their thoughts and compulsions. Common compulsions or rituals are repeated hand washing, habitual counting, or aligning objects. Obsessive Compulsive Disorder is time consuming because the compulsions are often repeated. The disorder causes great anxiety to those who suffer from it. In order to be diagnosed with OCD, the compulsions must take up at least one hour a day and must also cause grief in ones life. OCD can get in the way of having relationships with family, friends, and a significant other. The disorder often interferes with work and school. I encourage anyone who thinks they might have obsessive-compulsive tendencies to seek help. Hypnosis is a great tool to help sufferers of OCD. If you or someone you know has OCD, encourage them to seek help because they can learn to control it and improve their quality of life. And as you continue to relax, you realize just how powerful you are…just how powerful your mind is. You have the ability to control any part of your life that you choose to control. You are so very relaxed in every situation in your life and you are becoming happier day by day, that’s right. And if any issues arise in your life, you are able to deal with them quickly and efficiently, quickly and efficiently, because you always deal with issues in your life quickly and efficiently. That’s right, if any feelings arise which need to be dealt with, you deal with those feelings. If there is anyone in your life who you need to talk with about any issue, you speak with that person in a very mature and efficient way so that you can move on in your life. That’s right. You are becoming so very relaxed. You realize that your worth comes from your integrity as an individual and you desire to increase your integrity day by day. You do this by being an honest, wonderful, loving person and this adds to your self worth, that’s right. You are so very relaxed in all situations in your life, so very relaxed. I’d like you know to imagine yourself in a situation in your life, that’s right. See how relaxed you are and at ease. Imagine any situation at all. A situation which formerly would have perhaps caused some anxiety, but see now how you are relaxed and at ease and you deal with anything issues that arise in a very direct way. If those issues concern others, you address those issues with those people and this allows you to be relaxed, relaxed. You have a clear, calm mind. Realize that you are in control of your mind and your body. You are becoming more relaxed day by day. OCD is a serious mental disorder that can cause the sufferer and the people around them a lot of added anxiety. The Relieve OCD Hypnosis MP3 recording will help you overcome both obsessions and compulsions, no matter what your thoughts and actions are. The scientific community believe that OCD is both a psychological and biological disorder. Luckily, hypnotherapy can help you ease, overcome, and eliminate OCD. Your subconscious mind is in control of your OCD. This powerful hypnosis recording puts you in charge of your subconscious mind. The suggestions in this hypnosis session will help you fight against your OCD and you will win! In this recording you will be told to imagine your OCD tendencies and to imagine them being eliminated in your life. Listening to the Relieve OCD Hypnosis MP3 recording for 21 nights in a row before going to bed will help you overcome OCD. The suggestions on the recording are powerful and will start re-programming your subconscious mind right away. We also suggest you listen to the recording on a consistent basis either weekly or monthly to maintain the elimination of your OCD tendencies.